Home » Nature » San Diego is Ablaze! I don’t get to spend nearly as much time as I’d like to in Southern California, which is where I raised my boys. The boys are now grown and have flown the nest. I still own a home that is mostly rented out these days, and I happened to have been in “SoCal” last week for what I had hoped would be a peaceful week to see old friends and enjoy the beautiful weather. It didn’t turn out the way I’d planned, although in retrospect, I’m glad I was there because the last time there were fires threatening my house, I was in the remotest, most difficult to get home from part of India. 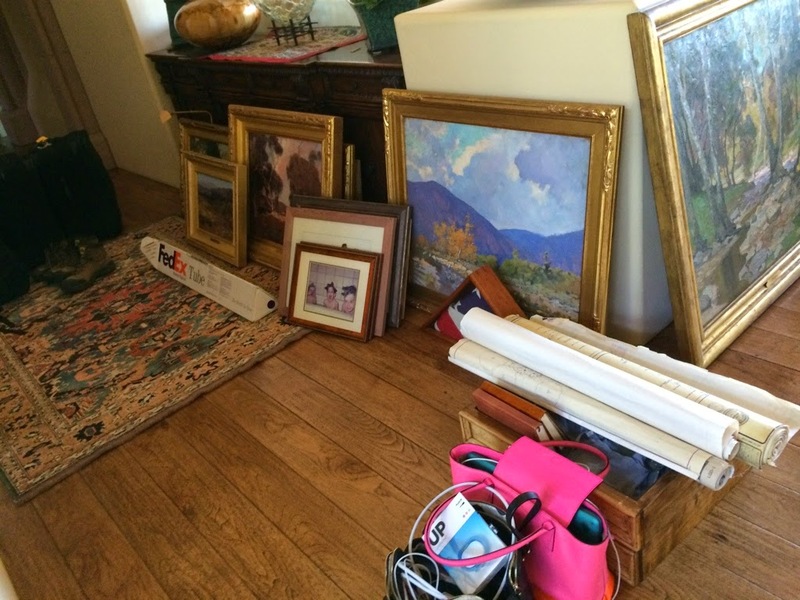 I had just gotten back to California and was doing various preparations to get the house ready for the summer rental season. I had just installed a new hot water heater for the main part of the house because the one I’d installed when I built the house in 1997 was failing, and I did not want to get a call from a tenant and be in the position of replacing it from half way around the world. The next day, Tuesday, was a busy day. 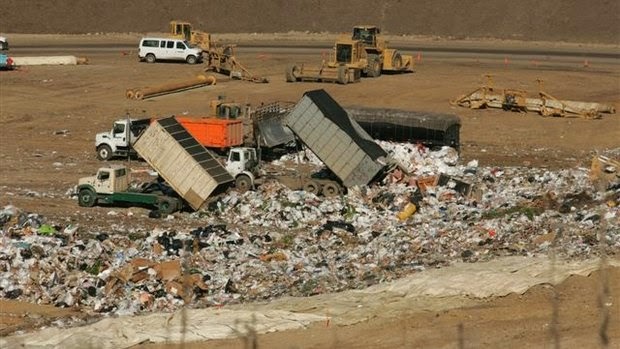 It began with a trip to the Otay Mesa dump right near the Mexican border – somewhere I’d never been before. A zillion years ago, when my kids were small and I’d just moved to California, I hired someone to build a raised bed garden so that I could grow vegetables and herbs. I was busy with my boys and didn’t know enough to stop him when he built the garden out of creosote-infused railroad ties. I lament now to think how many hours I sat on those timbers tending my garden, and at what they leached into the soil, and possibly into my tomatoes, zucchini and other fresh that I grew “organically” with such love and care to feed my family. I simply can’t bear to think about it now. About eight years ago, I had the garden dismantled and the railroad ties were placed at the very bottom of my property. We couldn’t find a disposal site close by that wood accept them. Well, getting them off the property was a to-do list item I was determined to cross off before I rented the house — and had a hazardous situation. The only place that would accept them was a long way away at the border, and they weighed over a ton, so it took some planning to get a trailer and Rand’s help to get them to the dump. We made it an adventure because if you’ve never been to a landfill, it really is an interesting experience (although once is enough for me). There was a prominent sign as you entered warning that you would encounter substances known to cause cancer and birth defects – yikes! We had to bring hardhats and I wound a kerchief around my nose and mouth during the long drive from the entrance to the landfill to where they directed us to dump the creosote ties. The men who were working there didn’t have any masks on, so they must have become desensitized to the strong smell of garbage. We left at 6AM and got to the dump right when it opened at 7. We were done and on the way back to Rancho Santa Fe pretty quickly, but we drove home the long way, up the 15, to avoid commuting traffic. This brought us through Escondido where we pulled in to the Home Depot to pick up numerous supplies for a wood garden shed I had ordered unassembled from Costco, and which was arriving later today. Since we had the trailer, picking up all these large size items made sense to do today. We were home by 9:30 or 10, which gave me a few hours to get office work done for clients before the shed was delivered. We had them drop off the shed materials on my neighbor’s empty lot below my house (their house had burned down in the “Witch Fire” of October 2007 and had gone through several owners since and not yet been rebuilt. Rand, Gustavo and I created a human chain to pass all the shed’s building supplies over the fence from the neighbor’s property to mine, and put the delicious-smelling fresh wood for the shed in the area where we would build it on my next trip back to California. While we were unloading the wood, I noticed ominous clouds on the horizon above the trees. So after finishing moving the shed materials, Rand and I decided to take a spin on the quad around the corner to see where the smoke was coming from. Once on Las Colinas, tt wasn’t hard to follow the smoke. We went down Zumaque, a street around the corner which had lost about seven houses in the 2007 fires, and saw fire several hillsides away. Neighbors were gathered there sharing their concern. We decided to go back to the house, get back to work since we had been gone most of the day ’til this point, and keep our eyes on the situation. Within less than an hour, the smell of smoke was apparent, and I could taste smoke in the back of my throat. It was time to close the computer and head back to Zumaque. What a change! While I watched, the fire progressed past the last hillside, leaving just open fields and a steep hill until the fire would reach the back of the houses on Zumaque. I was shocked. The hills were on fire and the flames were enormous! It’s been over 90 degrees and we’d been experiencing hot, strong, dry Santa Ana winds all day, and these were ideal conditions for wildfires. The winds were bringing the fire directly in our direction. I rode back to the house to find Rand and tell him we needed to get ready to evacuate. He was on a business call, but dropped everything and started working with me to prepare. 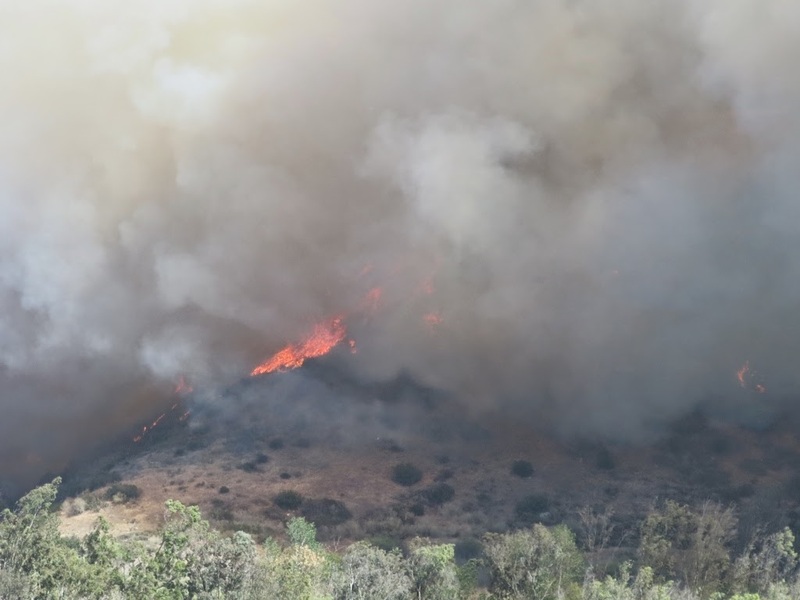 The fire we had seen became know as the “Bernardo Fire,” and it got within a few hundred yards of the house that afternoon before helicopters and planes dropping water stopped it. I think the fact that the Viterbis (founders of Qualcomm) and the Pritzkers (Hyatt Hotel family) have large homes off the street across the way that backs up to the canyon helped enormously to bring in the “cavalry” and save their homes, and indirectly, mine. I’ve very grateful to the firefighters who braved great danger and worked tirelessly in extreme conditions to combat these fires. By mid-afternoon (2-3p.m.) Rand and I were turning on sprinklers, watering the roof, declining to evacuate (which had been suggested), taking all the art off the walls and collecting family photos, passports and other important papers and other “irreplaceables,” plus my house plans in case I had to rebuild the house in case of a worst-case scenario. I put everything in the front hall, ready to be moved into cars and trailer and removed off the property to somewhere safe if the fires got closer. In the end, we didn’t leave, and at 11PM, it was time to meet my son, Robby’s flight from Connecticut. I was exhausted to say the least, but I didn’t want to miss any time with my boy, so we even took him to In-n-Out Burgers for the ceremonial meal-on-the-way-home from the airport. The fires in San Diego continued, and our narrow escape on Tuesday turned out to be just the beginning. By later in the week, the house was threatened by another even larger fire called the “Cocos Fire” that came from a different direction. By that time, as became a world-famous story, multiple wildfires had popped around North San Diego County simultaneously. Fire-fighting personnel and resources were seriously taxed, and the air drops of water that had so promptly gotten the Bernardo fire under control were impossible to deploy on every fire. By Friday, however, the Cocos Fire had become the most severe and many high-value homes in San Marcos had burned down. The Governor of California and the U.S. Military both started sending resources in, and San Diego was declared a disaster area, which also added support. 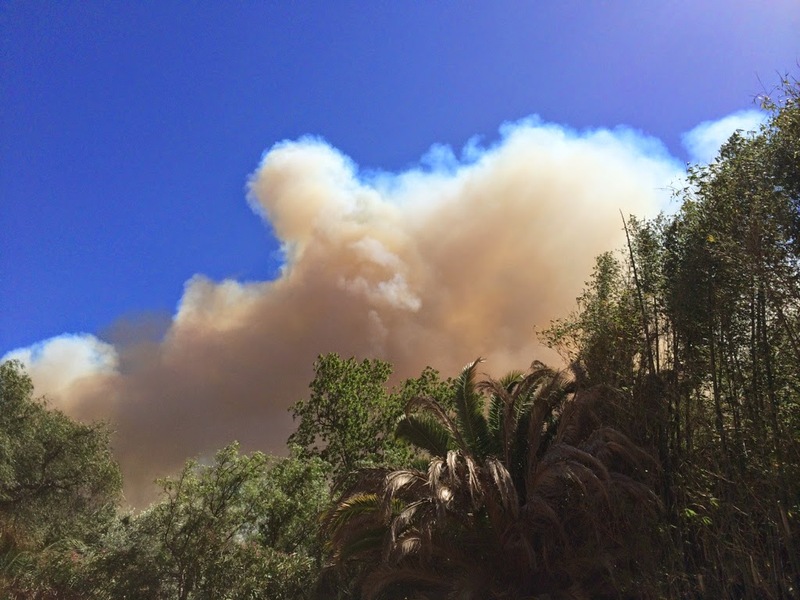 And finally the fires were gotten under control, and the house in Rancho Santa Fe was saved…at least for now. This probably won’t help its rental chances though.